[Minecraft 1.4.4] Single player commands mod is the delightful mod which allows you play Minecraft in single player. The previous version of SPC was 1.3.2 and now its expected to be available for this v1.4.4. There are some console mods which resembles with Single Player commands mod but they aren’t useful enough. 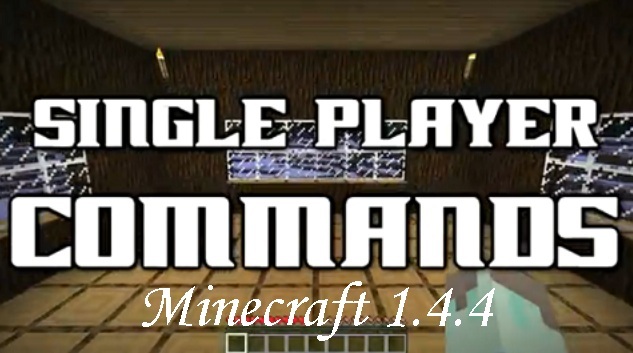 So check the rest of the details below..
Download Single Player Commands Mod for Minecraft 1.4.4 from the link above. In windows, go to Start > Run > Type “%appdata% and hit enter. Open Minecraft.jar file using WinRar/7zip. Open the Mod file using Winrar, Drag and drop all the files there. Press ‘T’ and then start typing commands, enjoy. So guys have fun playing Minecraft and keep visiting here to check the latest updates of your favorite game online. If you have any queries downloading this file please let us know via comment section..